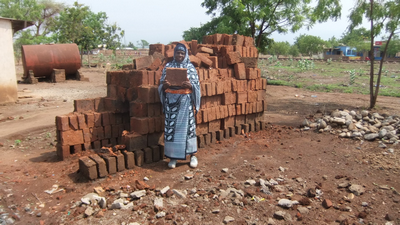 Nia is a rarity in the Moshi region, a lady who runs a brick making business! Although this is traditionally a male business, she said, she saw how profitable it was and thought ‘if men can do this, why can’t I?’. Using the initial capital grant received in 2010, she bought the frames for the bricks and the materials, and started building the firing structure. This is hard physical work and she now employs an assistant. The structures, rising to over 8 feet in height and measuring 10 feet in length, have a hollow centre where the fire is set. The process takes two days and she ends up with 1500 bricks which she stores awaiting collection lorries. A year ago she took out a loan to double her capacity and has now repaid in full. Nia has a good business and is sending her four children to schools in Moshi. She has moved to a safer and better built house and acknowledges that her life has changed beyond recognition thanks to the Mondo programme. More recently she has also started growing rice: ‘Both rice and bricks take a long time,’ she explained, ‘so while I am waiting for one, I can do the other’. If you would like to help support more women like Nia, we are currently raising funds for our next round of grants and loans. To help us achieve our target you can donate here.